Prior to Bishop Raphael Hawaweeny’s death in 1915, pretty much all the Syrian (Antiochian) Orthodox in America recognized his authority. This included St. George Syrian Orthodox Church of Grand Rapids, Michigan, which was incorporated in 1910. The parish was under St. Raphael, and all seemed to be well. 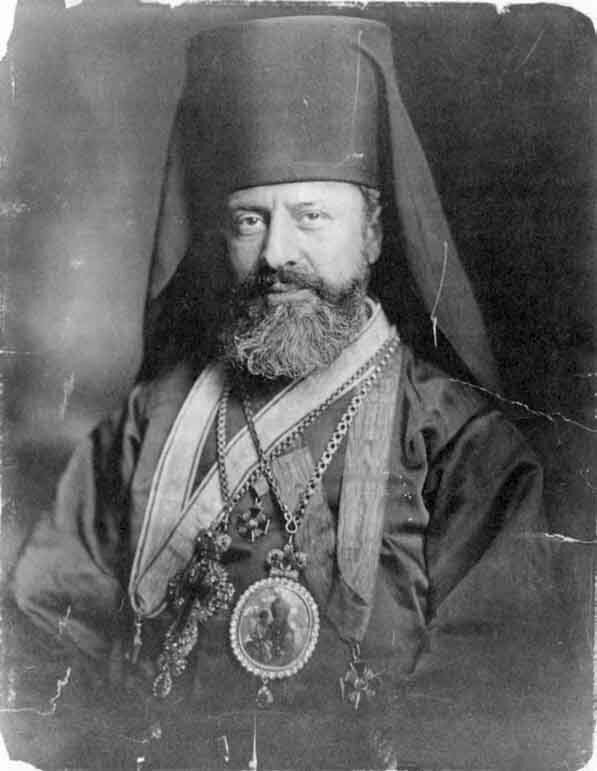 But in February 1915, St. Raphael died, and his flock split: some recognized the authority of the Patriarch of Antioch, and others the authority of the Russian Holy Synod and its North American Archbishop. This marks the beginning of the “Russy-Antacky” schism, which divided Antiochian Americans for many years. This split not only divided St. Raphael’s diocese, but individual parishes as well. At St. George in Grand Rapids, the priest came back from St. Raphael’s funeral and told his congregation to sign a declaration of loyalty to the Russian archbishop. Not everyone complied, and pro-Antioch parishioners insisted that their priest commemorate the Patriarch of Antioch in the Divine Liturgy. Meanwhile, the pro-Russian group tried to amend the parish articles of association to place church property under the control of the Russian Holy Synod. The factions went to court, culminating in Hanna v. Malick, a 1923 Michigan Supreme Court case. The key question in the case is which faction — Russy or Antacky — should have control of the church property. To figure this out, the court had to determine which hierarchy — Russian or Antiochian — was recognized by the parish when it formed in 1910. The Antacky members “claim that they organized under and are subject to the supreme jurisdiction” of Antioch, “whose representative in America was Bishop Raphael of Brooklyn.” The Russy members “claim that this local church was organized under and has always been subject to the supreme jurisdiction” of the Russian Church. All persons believing in the divinity of Christ, in God the Father and the Holy Ghost, the sacrament of baptism and marriage in accordance with the articles of faith established by the Orthodox Greek Church of Damascus, Syria, shall be entitled to membership. Members are admitted by baptism and by confession of faith under the rules and tenets of the Orthodox Greek Church of Damascus, Syria. They may be suspended or expelled for violation of the teaching and precept of the church as laid down and expounded by the bishop of the Syrian Greek Orthodox Church of America, resident at Brooklyn, New York. The trial judge observed that “at first the writings of Bishop Raphael gave to the Patriarch of Antioch jurisdiction over the Syrian branch of the Orthodox Church in the United States, and later gave expression to language indicating that all the branches, including the Syrian branch, of the Greek Orthodox Church in America, were under the jurisdiction of the Holy Synod of Russia.” Without a clear-cut answer from St. Raphael’s own writings, the judge looked at two non-Orthodox sources: Funk & Wagnalls’ Religious Encyclopedia and the Encyclopedia Britannica. The former reported that “the Patriarch of Antioch elevated Raphael to the rank of bishop” (but that Raphael was consecrated by Russian hierarchs), while the latter noted that the Russian archbishop in America “is assisted by two bishops, one for Alaska […] and one for Orthodox Syrians, residing in Brooklyn.” The secular sources don’t seem to settle things, either. Both parties have a legitimate argument in this case, but as the judge consistently reiterated, this case is ultimately about the intent of the original incorporators of the Grand Rapids church — not about the relative claims of Russia and Antioch in America. Those claims are relevant only insofar as they help us better understand the incorporators’ intent. This is a terribly fascinating case from a historical perspective, and tells us a lot about how the early Antiochians in America thought about themselves. But what are the legal lessons we can learn? The district court judge — affirmed by the state supreme court — could not have employed “deference to higher church authorities” if he had wanted to, since the entire dispute was over which was the correct higher church authority. The judge was forced to employ something along the lines of a neutral principles analysis. Did he get the right answer? Well, it depends on the question. The judge was trying to figure out the intent of the original incorporators, and based on the language of the official documents, it does seem like they intended to be under Antioch. Were they really, in fact, under Antioch? What would the outcome be if the claim was between Antioch and Russia themselves, and actual jurisdiction had to be determined? That is a much, much more complicated question, to which there isn’t a single, clear-cut answer.